These five bank stocks could produce strong growth and income for your portfolio. Most banks have come a long way in the years since the financial crisis, and many bank stocks have risen quite a bit over the past year or so. Expectations of rising interest rates, economic growth, and looser banking regulations have created a renewed sense of optimism among investors. Having said that, there are still some excellent long-term opportunities in the sector, many of which also pay attractive dividends. Here are five smart choices for dividend investors who want a piece of the banking sector. Wells Fargo is a longtime favorite of Warren Buffett, mainly for its consistently efficient and profitable operations, and its history of prudent risk management. In its most recent quarter, Wells Fargo reported a return on assets (ROA) of 1.15% and return on equity (ROE) of 11.54% -- both handily surpassing the industry benchmarks of 1% and 10%, respectively. 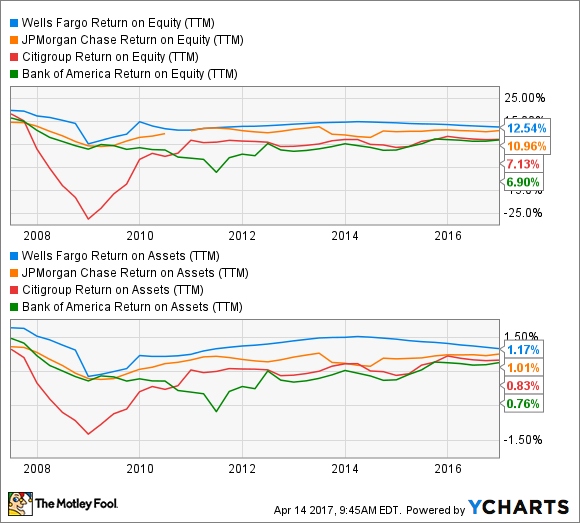 In fact, over the past decade, Wells Fargo has consistently been the most profitable of the "big four" banks. Additionally, because of the fallout from the infamous fake-accounts scandal, as well as a mixed first-quarter earnings report, Wells Fargo is the only one of the "big four" that's actually trading for less than it was at the beginning of 2016. Now could be a good time to get into what Warren Buffett has called an "incredible institution" at a discount. Toronto-Dominion Bank, better known as TD Bank, is based in Canada, but has a large and rapidly growing U.S. presence. Over the past decade or so, TD has grown aggressively through a series of acquisitions, as well as organically. I recently wrote an in-depth discussion of the reasons I love TD Bank and own the stock in my personal portfolio, but one big reason is TD's emphasis on customer service and convenience. Known as "America's Most Convenient Bank" since its 2008 acquisition of New Jersey-based Commerce Bank, TD branches are open longer hours than most competitors, as well as on Saturdays and Sundays in many locations, and TD employees are known for providing more personalized service than most other banks. U.S. Bancorp, the fifth-largest U.S. bank, is another Warren Buffett favorite. At first glance, the bank looks extremely expensive -- its valuation of 2.1 times its book value is by far the highest of the big banks. With U.S. Bank, however, you get what you pay for. The bank has one of the most profitable and efficient operations in the entire banking industry, and has done a great job of gaining market share over the past decade, having emerged from the financial crisis even stronger than it was before. New York Community Bancorp is a niche lender, primarily making loans on rent-controlled or rent-stabilized apartment buildings, mostly in New York City. Because it's a leader in its niche market, and because rent-controlled buildings have naturally low default rates, the bank's charge-off and delinquency rates have stayed remarkably low, even during the depths of the financial crisis. The bank has also maintained one of the best track records of efficiency in the entire banking industry, and is the most efficient bank on this list by a wide margin. As you may have noticed from the chart, Bank of America actually pays the lowest dividend of any bank stock on this list. However, I believe that will change in the not-too-distant future. Specifically, over the past several years, Bank of America has traded for a steep discount to its book value, mainly due to low profitability (which is starting to improve). To take advantage of this situation, the bank chose to spend the majority of its capital on repurchasing its own stock at a discount, thereby making dividend increases a lower priority. Now that the bank's valuation isn't far below its book value, I wouldn't be surprised if dividend growth moves up on management's priority list.